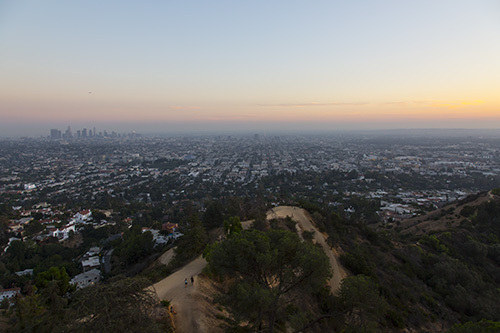 Curbed Los Angeles recently published a telling article on the new legislation that relaxes rigid restrictions on building in Santa Monica. These new rules allow architects to design more freely, breathing a new lease of life into city planning and construction. Development often gets a bad reputation despite the fact that many designers like us work tirelessly to make our buildings more useful and beautiful. We spoke to our LA studio Director Charlotte Docherty to understand the benefits of this exciting new progression. Why is this new legislation positive / important for architecture? Walking down the street in Santa Monica can feel like time traveling. From building to building you can see that as land value has increased over time development has swollen to fill the maximum dimensions permitted by code and have secured the maximum square footage. 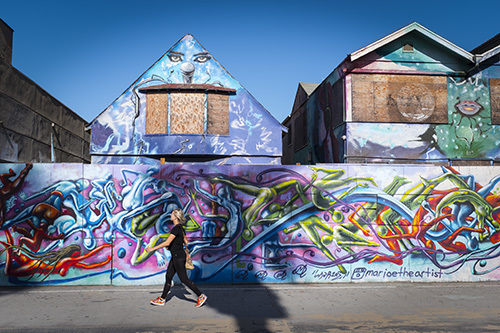 Santa Monica has been inundated with boxy monotonous structures and the City Planners have responded with ordnances each year to chip away at the box. However, these ordnances were reactionary and so prescriptive that it just merely led to new variations on the monotony. The reason that the new Santa Monica Downtown Community plan appears to be so exciting, is that the City have invested the time and community engagement that is necessary to get down to first principles and establish what is really important to them. The design guidelines developed explicitly state they are not prescriptive but aim to provide guidance to landowners and designers. This shifts the conversation from a mathematical exercise of setbacks and percentages to design principles, proportions and context. It is only a starting point but it feels like a big step in the right direction. What is BAA going to do now you have more creative freedom? We want our projects to engage with the streetscape, supporting Santa Monica’s aspirations to improve the public realm and walkability. We are excited that by removing the parking requirement minimums we can use our London experience to show how facilities can be integrated into a building that encourages biking/ running/ walking to work. We look forward to working with developers to show them they can meet the high affordable housing targets while still making the project financially viable. There are also many adaptive reuse incentives within the community plan which we will be well placed to administer. What are the benefits of transparent design solutions like public walkways in a city? Often when walking in Santa Monica you can be the only person on the sidewalk particularly in the evenings, crazy but true! I have once or twice been caught out in a situation where I felt uneasy, simply because I hadn’t expected there to be so few people in a city centre. By increasing the footfall on the streets while also increasing activity at ground floor it improves public safety. When people feel safer they are more likely to leave their cars at home. We also look forward to more projects where the ground floor isn’t dominated by access to parking garages. How can London policies learn from this progression? This is a tough question because I still think the system in Santa Monica is too preoccupied by prescribing dimensions rather than trusting that designers have a sensitivity to context when designing their buildings. I do however understand that removing the prescribed dimensions would potentially open them up to scrutiny over subjective decisions, or slow down the progress of their planning team. The new code does allow designers to think differently, providing designers the opportunity to put forward alternatives that may be more desirable that the standard dimensional solutions. This is great news, as this level of flexibility was previously not so readily accessible and may mean architects can design first and put down their calculators! They encourage the designer to read a set of thoughtful Design Guidelines and use their skill and experience to form an appropriate design response. The question is whether a client is willing to take the risk of the Architectural Review Boards interpretation or will many projects continue to do the minimum required. Are there any examples of BAA work that represents this change in development? 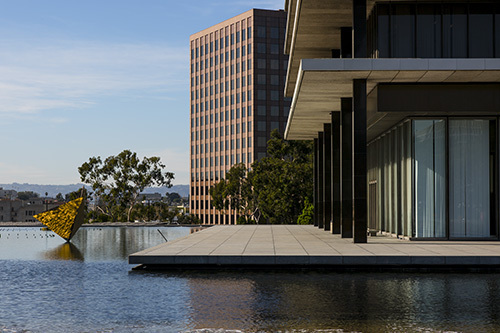 In Culver City we have had direct experience of how good design can spearhead change in code. We transformed a single family lot into 4 homes in a manner that the Planning Commission and City Council agreed was elegant and sensitive to the neighbourhood. As a result, the Mayor of Culver City has tasked the planning department with creating a new ordnance that encourages more projects similar in nature to ours. The problem is that this process took a great deal of time, which is not in the interests of a developer client unless they are committed to doing something special. 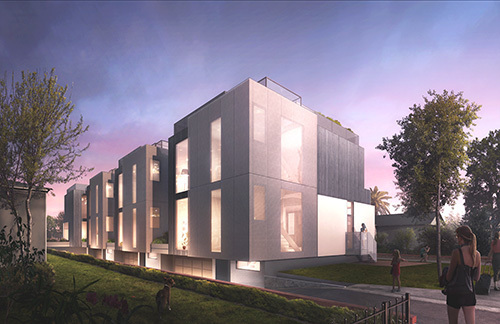 For our Culver City project we were fortunate enough that our client, Wylan James Developments, saw their niche in the market as providing contemporary mid-sized homes that could be owned fee simple and each have yard space that make them family friendly. This aligns perfectly with the objectives of Culver City and also opens doors for great design. Once the code has changed, the next project of this type is far easier to realise. The hope is that the community plan in downtown Santa Monica creates a framework that means a project can be unique without having to be a trailblazer!